One recent myth, prevalent in the Paleo Diet community, is that the keto diet is stressful to the body ¹. This idea arises from misunderstandings about cortisol — “the stress hormone”. There are two different arguments we know of, and this post will address the first one, the “gluconeogenesis requires cortisol” myth. Gluconeogenesis does not require high levels of cortisol. When blood sugar begins to get low, glucagon — the primary hormone responsible for ensuring adequate blood sugar — is produced. This promotes gluconeogenesis, and it happens before blood sugar gets low enough to trigger increases in cortisol. When blood sugar gets so low that excess cortisol is produced, it is also low enough that symptoms of hypoglycemia (“low blood sugar”) appear — anxiety, palpitations, hunger, sweating, irritability, tremor; or in more extreme cases, dizziness, tingling, blurred vision, difficulty in thinking, and faintness. So hypoglycemic signs are a good way to judge if cortisol is involved. Since keto dieters do not normally appear to suffer from hypoglycemic episodes, especially when eating enough protein and not fasting for long periods (indeed, hypoglycemic episodes appear to be reduced by keto diets), it is unlikely that cortisol comes into play to regulate blood sugar for normal keto dieters. If you are concerned about your blood sugar, and whether cortisol is being called upon to regulate it, we recommend you measure your blood sugar levels with a glucometer such as this one (but any drug store should offer several models). If your blood sugar is sometimes too low, then we recommend that you experiment with increasing your protein or how frequently you eat. On a keto diet, your body makes the modest amount of glucose it needs out of protein in a process called gluconeogenesis (GNG). There is a widely-held misconception that for GNG to occur, there must be high levels of the stress hormone cortisol in the blood. This mistake comes out of the fact that cortisol stimulates GNG. Therefore, it is reasoned, whenever you rely on GNG, your body has to produce and circulate more cortisol. This, however, is like arguing that since a reliable way to make people laugh is to tickle them, that every time you hear someone laughing it means they are being tickled. It turns out there are other ways to make people laugh, and there are other hormones that induce GNG. The usual hormone to stimulate GNG is glucagon. Glucagon is produced when blood sugar gets low, and its primary function is to restore blood sugar to optimal levels. Cortisol levels rise when blood sugar reaches an even lower level. That is, the blood sugar threshold for cortisol production (55 mg/dL) is lower than the threshold for glucagon (65 mg/dL) ². This lower threshold could be reached if GNG was somehow obstructed. There are some rare disorders that prevent GNG, such as Fructose 1,6-Diphosphatase Deficiency or Glycogen Storage Disease, but in most people, GNG is a straightforward, unimpeded process. In fact, it turns out that the level of blood sugar that has to be reached to significantly increase cortisol is so low that clinical symptoms of hypoglycemia also start to appear at that level ³. Not only are reports of hypoglycemic episodes in studies of keto dieters rare, it has been known since at least 1936 that keto diets with adequate protein help prevent hypoglycemia ⁶. (It is reported in that paper that keto diets with lower protein help somewhat, but not enough.) A more recent paper from 1975 asserts that the best treatment for hypoglycemia is a low carbohydrate diet with frequent small meals, though they note that this worsens the condition in occasional cases where the patient has one of the above-mentioned or similar disorders ⁷. The only other examples of hypoglycemia we could find referred to the initial fasting or severely calorie-restricted phases of ketogenic diets for epilepsy. Based on this collection of observations, it appears that in keto dieters, the glucagon response is enough stimulate adequate GNG to restore blood sugar, unless they have rare GNG disorders, are eating insufficient protein, or have been engaging in extended fasting. If you experience symptoms that could indicate hypoglycemia, and you are concerned about the possibility that cortisol is being activated to regulate your blood sugar, we recommend you purchase a blood glucometer. It is an inexpensive device that measures the sugar in a drop of blood you get from your finger. Excess cortisol is not deployed for blood sugar regulation unless your blood sugar drops below about 55 mg/dL. If you notice this happening, you could experiment with increasing your protein intake or the frequency of eating. GNG is stimulated by glucagon, and as long as the GNG response to glucagon is enough to restore blood sugar before it goes down to about 55mg/dL, cortisol will not be called upon to regulate blood sugar. By the time blood sugar levels have gotten so low that cortisol is deployed to help fix it, hypoglycemic symptoms also appear. Keto dieters don't appear to experience hypoglycemic symptoms (except in some cases involving inadequate protein or prolonged fasting). In fact keto diets, especially protein-adequate keto diets, have been used to reduce the occurrence of hypoglycemic episodes in susceptible people. Therefore it is not true that because keto diets use GNG for blood sugar regulation, they cause stress to the body. Since blood sugar is easily measured, you can indirectly test for whether cortisol is being used to regulate your blood sugar yourself. If you find it to be low, there are other strategies you can try to alleviate it that don't involve giving up your keto diet. That latter one seems to be a mistaken generalization that came from taking Mat Lalonde's comments out of context. Lalonde was describing his experience of severe hypoglycemia that happened after extremely intense exercise. He said: “Gluconeogenesis gets turned on by cortisol and other hormones and it’s not that fast. In order for gluconeogenesis to ramp up, cortisol has to ramp up.” By “ramp up”, we infer he means ramp up enough to keep up with the excessive intensity he had induced — a situation unlikely to occur in most keto dieters. We hope to return to the subject of keto diets and athletics another time. ² Evidence type: repeated experimental evidence. Ober, K. Patrick (Ed.) Endocrinology of Critical Disease. 1997 Humana Press. The importance of maintaining a fairly constant level of serum glucose is reflected in the elaborate system for defending against falling glucose concentrations. Four major counterregulatory hormones are of varying importance and effectiveness in counteracting a hypoglycemic threat, and there is a hierarchy of response of the factors that counterbalance the threat of hypoglycemia. Each factor has a somewhat different threshold for activation (39 ³, 40 ⁴) and the physiological importance of each component in the system of defense against hypoglycemia tends to be reflected by its position in the hierarchy. Small decreases in the plasma glucose concentration to the threshold of 65 mg/dL (3.6 mM/L) are usually sufficient to trigger the secretion of glucagon and epinephrine (40 ⁴,41 ⁵), the hormones that are of greater counterregulatory importance. Cortisol levels do not increase until the blood glucose falls below 55 mg/dL. The single most important counteregulatory hormone is glucagon, which enhances hepatic glycogenolysis and gluconeogenesis; without glucagon, full recovery from hypoglycemia does not occur (1). Epinephrine, which has an additional action of inhibiting insulin secretion, is not necessary for counterregulation of hypoglycemia when glucagon is present, but it becomes essential in the absence of glucagon (a common occurrence in the patient with insulin-dependent diabetes). Growth hormone and cortisol are slower to act as counterregulatory agents, and these hormones do not make any substantial contribution to glucose counterregulation during acute insulin-induced hypoglycemia (42); since growth hormone and cortisol cannot compensate effectively for hypoglycemia in the absence of glucagon and epinephrine, they are of secondary importance in the counterregulatory scheme (34). ³(Ober's 39.) Evidence type: experimental. Schwartz NS, Clutter WE, Shah SD, Cryer PE. Glycemic threshold for activation of glucose counterregulatory systems are higher than the threshold for symptoms. J Clin Invest 1987;79:777-781. Arterialized venous plasma glucose concentrations were used to calculate glycemic thresholds of 69 +/- 2 mg/dl for epinephrine secretion, 68 +/- 2 mg/dl for glucagon secretion, 66 +/- 2 mg/dl for growth hormone secretion, and 58 +/- 3 mg/dl for cortisol secretion. In contrast, the glycemic threshold for symptoms was 53 +/- 2 mg/dl, significantly lower than the thresholds for epinephrine (P less than 0.001), glucagon (P less than 0.001), and growth hormone (P less than 0.01) secretion. ⁴(Ober's 40.) Evidence type: experimental. Mitrakou A, Ryan C, Veneman T, et al. Hierarchy of glycemic thresholds for counterregulatory hormone secretion, symptoms, and cerebral dysfunction. Am J Physiol 1991;260:E67-E74. The glycemic thresholds for increases in plasma growth hormone, glucagon, epinephrine, and norepinephrine were not significantly different from one another (-67 mg/dl) but were significantly higher than that for cortisol (55 t 2 mg/dl, P < 0.004-0.0003) and for the appearance of autonomic symptoms (58 t 2 mg/ dl, P c 0.039-0.001). ⁵(Ober's 41.) Evidence type: experimental. Bolli GB, Fanelli CG. Unawareness of hypoglycemia. N Engl J Med 1995;333:1771-1772. In normal humans, small decreases in the plasma glucose concentration to the threshold of 65 mg per deciliter (3.6 mmol per liter) elicit the secretion of the rapid-acting counterregulatory hormones glucagon and epinephrine, which oppose the glucose-lowering effects of insulin in plasma within minutes. Should plasma glucose levels decrease further, to about 55 mg per deciliter (3.1 mmol per liter), the secretion of counterregulatory hormones increases, and autonomic symptoms (anxiety, palpitations, hunger, sweating, irritability, and tremor) appear, as well as neuroglycopenic symptoms (dizziness, tingling, blurred vision, difficulty in thinking, and faintness). Waters(5) in 1931 advised strict curtailment of the carbohydrate in the diet, most of the calories being derived from fat. Following this a high fat, low carbohydrate diet with feedings divided into six daily meals was generally adopted. On this regime there was often prompt improvement; but while hypoglycemic attacks were diminished in number, they still occurred with alarming frequency. It was realized, then, that the ingestion of large amounts of protein would supply glucose to the blood stream at a constant, slow rate, without the production of a hyperglycemia. (a) It causes no hyperglycemia and thus avoids excessive production of insulin and secondary hypoglycemia. (b) It provides a source of glucose over a prolonged period of time. (c) It allows in severe cases further restriction in carbohydrate than could otherwise be effected. 2. These facts justify the use of a diet high in protein and low in carbohydrate in the treatment of this condition. Hofeldt FD. Reactive hypoglycemia. Metabolism. 1975 Oct;24(10):1193-208. An occasional case may show worsening on the low-carbohydrate, high-protein diet. Since there is an aminogenic influence on insulin secretion, this could potentially aggravate the reactive hypoglycemia in some patients. However, the concurrent protein stimulation of glucagon release could offset the effects of insulin. (18,23,145) Our studies on hepatic gluconeogenesis have shown that in patients with the fructose 1-6 diphosphatase deficiency there is characteristically a worsening of symptoms when stressed with a low-carbohydrate (ketogenic) diet. These patients, in order to maintain blood-glucose levels early in the fasting state, must call on adrenergic mechanisms to release glycogen stores. Similarly, an occasional patient will develop intolerant symptoms while on the low-carbohydrate, weight reduction Stillman or Atkins diet. These patients may well show similar hepatic enzyme defects. In this special low-carbohydrate intolerant subgroup, the stress of any ketotic diet is avoided and dietary carbohydrates are increased to 150 g or greater. We are presently conducting studies on the therapeutic effectiveness of folic acid (15 mg/day) in these patients with beneficial results. Very good to know, and well-referenced. Thank you. I remember the first time I came across the "cortisol" argument. It took me about five minutes to find a couple of online biochem textbooks that said, "gluconeogenesis is activated by glucagon". Makes me wonder how these things get started. They "get started" because people have different-than-expected results. I would like for it to be the case that instead of discounting the anecdotes of people who seem to have a "cortisol-like" response, that these instances be investigated instead of discarded as insignificant or rare. Many books still contain statements like, "you need to eat carbs for your brain" too. Doesn't make it right. Brash, I agree that we should not belittle or discount people's experience, and I also agree that scientific investigators should not ignore individual responses. Of course, if a response is rare, it can be hard to generalize from. We can acknowledge symptoms without agreeing on an explanation of the cause. I don't know exactly what you mean by "cortisol-like", but I associate that description with blood sugar disturbances. If a keto dieter is having a cortisol excess because of blood sugar going too low, then that is testable with a glucometer, and possibly fixable through eating enough protein, and eating frequently enough. If a keto dieter is having such symptoms and doesn't have blood sugar disturbances, that would be interesting to know, too, but we can only find out by testing blood sugar. In this case, it has nothing to do with "results". It's what we know about human physiology. If someone says that low-carb diets are stressful because elevated levels of cortisol are necessary for gluconeogenesis, they are factually incorrect. I don't discount anyone's experience, but when we're making decisions about how to improve some health condition, it's better to make those decisions based on evidence, not conjecture. Well, zounds! I bow to your majesty. It's possible that people mistakenly blame ketogenic diets when it could be high protein intakes, which have been shown to increase cortisol. There are a few carb restriction trials that show no significant (or any) change in cortisol. john, that's an interesting observation. I hadn't thought of it. I'll be sure to look into that angle in Part II, which will also explore other reasons that the higher cortisol seen in some studies may not be as it seems. Thank you. Of course this strategy is problematic for us type 1 diabetics. Besides not making insulin, we also do not make any amylin which appears to "control" glucagon releases. I am not qualified to explain it, so consider this response unreliable. I am a sugar making machine. I eat salad, I release glucagon; I eat steak, I relase glucagon; I eat rocks, I relase glucagon. And I often don't just release normal abounts but I often get flooded with it. Glucagon is released in response to food. Typically I don't eat breakfast but drink it in the form of very high fat, and my glucagon release is restrained. Then when I eat my lunch, wham. I'm hit ahrd with a sugar spike regardless of what I eat. Testing shows if I eat a breakfast, then my insulin need at lunch is halved. This lack of the incretin hormone alylin and the crazy responses we often get is one reason I advocate a GLP-1 treatment such as Victoza for type 1's who eat ketogenically and practice intermittent fasting. I didn't see anything about the times that people who live highly active keto lifestyles re-carb, could this act also potentially dampen the backlash that ketoers get? If you re-carb once a week, or over the weekend, would that satisfactorily provide the nutrients needed to prevent the need for Gluconeogenesis? In all the literature read and studying I've done, two things have been repeated. Protein intake needs to have an eye kept on, and keep it low-carb with a re feeding period to produce enough nutrients provided from carbs. I think that's missed by so many, that the opposition could easily be turned around if people did more reading before making drastic changes such as a diet overhaul. I guess because it's widely offered as a weight loss solution, and not the lead to a new lifestyle. There's no reason to "prevent the need for gluconeogenesis". You're going to go into GNG overnight if nothing else, and it's a good thing you do, otherwise you'd die in your sleep. There aren't many tissues in the body that must have glucose, but some of the ones that do are pretty darned important, like your red blood cells and some of your brain tissue. And I don't see how a diet that provides for fat loss can't also be "the lead to a new lifestyle." If what you're eating is causing you to store excessive fat, it stands to reason you need to change how you're eating and what you're eating, which means adopting a new lifestyle. The problem isn't that people change eating to lose weight, it's that they don't keep their diet changed even after the weight's off. The topic of this particular post is a narrow issue: we want everyone to know that increased cortisol is not necessary for gluconeogenesis. On the broader issues of how people should eat, in light of how diet affects cortisol levels and how gluconeogenesis works, we also have opinions, and we're working on writing more about it. I really enjoy the paradigm shifts that I get from chatting with Amber. One of them is the paradigm shift from thinking of gluconeogenesis as basically a "bad" thing -- a stressful process that the body "falls back on" when it has to do -- to basically a "good" thing -- a normal process that the body uses to generate exactly as much glucose as it needs on demand. In any case, she appears to be right about one specific thing: gluconeogenesis does not require elevation of cortisol. So on that account, at least, it is not a stressful process that you ought to avoid. Following up to my own comment because overuse of the word "paradigm shift" bothers me. The idea that gluconeogenesis is a "basically bad" fallback is not an important or overarching enough idea to be called a "paradigm", and changing my view on that isn't really a "paradigm shift". I guess the phrase I'm looking for is something like "a shift in perspective". From something like "We need to control carbohydrate input to the body carefully to manage our blood sugar levels in order to avoid forcing it into weird modes like gluconeogenesis." to something like "You know what? The body does just fine maintaining its own blood sugar levels using perfectly normal, effective modes like gluconeogenesis." Disclaimer: all of the above is speaking loosely. You know how we have ambitious goals for ourselves not to say things that we can't rigorously justify on our blog? Well, I hereby give myself permission to ramble freely in the comments and, if I say something stupid, that'll just be an opportunity to learn when someone corrects me. Well, I certainly share the perspective that gluconeogenesis is an advantage, not something to be avoided. Relying on the body to decide how much glucose to make, and when to release it seems ideal. I also don't know of any nutrients that you would want to get from carbs that you can't get on a keto diet. The main reasoning behind carb cycling is to maximize glycogen stores -- I think there is evidence that repeatedly depleting them as much as you can and then "super-compensating" can make a large difference in capacity. However, you would have to expand your glycogen stores about 20-fold to compare to the caloric reserve you can get out of fat if you are keto-adapted. As far as I understand, the question of how much work-out intensity you can get out of fat when keto-adapted compared to using glycogen when not keto-adapted is not completely worked out, but Phinney has shown that it is much more than previously believed. That is, it is conventionally believed that carb-depleted athletes simply can't do as intense or as long exercise, but this belief comes from testing the first days of carb-depletion. 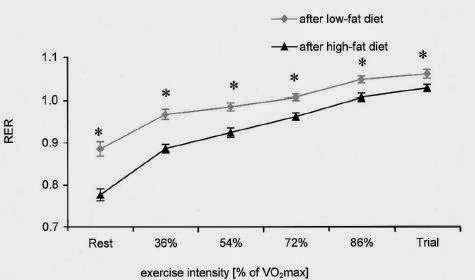 It turns out that measurements like VO2 max actually change very substantially in keto-adapted athletes. Also, it is not known how much of a setback a short carb-up is to a keto-adapted athlete. Because the subtler aspects of keto-adaptation in athletes can take weeks, it's possible that a weekly carb-up essentially prevents you ever from fully adapting. Finally, some people need the therapeutic value of ketosis all the time, and can't carb-up, so one of our goals is to dispel erroneous concerns that people have about its safety so they can know that they are doing the right thing, and not inappropriately raise their cortisol over non-issues. I've done weightlifting and sprinting without any "carb refeeds" and without experiencing problematic symptoms. I take long rests and do relatively low volume, so it's possible that changes things. But I do know two female bodybuilders who stay keto, and their training regimens seem to be more glycogen intensive than mine. Ate a zero carb diet for 5 months, 100% carnivore, as an experiment. One month 4 I rana half marathon trail run, on a high difficulty rated trail. I would put that effort as equal to a marathon over roads. During that time I also continued my boxing and weightlifting regimen. No carb up was required and I agree this is a myth. At the end of month 5 I has a full set of labs done which came out perfect except for my thyroid which seemed to trend slightly towards high (the exact opposite of what everyone says will occur). Upon further investigation which included a nuclear scan, my thyroid was found to be perfect. I still hear people say that they want to exercise with both high intensity and high frequency, eg crossfit, and ask me if that will work on a ketogenic diet. I always refer them to your low-carb limbo post. I don't know that it's sustainable, and that makes me suspicious about its desirability. That is, if it turns out to be true that a ketogenic diet is not supportive of some exercise regime, then maybe that exercise regime is taxing your body in an unhealthy way. Your diet is still almost completely carnivorous, is it not? Good post and totally right. However, it might not be right conclusion for diabetics: "Inappropriate hyperglucagonemia appears to be a common feature of human diabetes that must exaggerate the metabolic consequences of insulin lack and unfavorably influence diabetic control." This might lead to glucagon resistance or alpha cell weariness and hence, the plan B to restore normal blood levels (cortisol) will come into effect. So in some people, cortisol will be higher. Several little molecules come to mind to reduce the damage from chronic stress hormone secretion. I agree for the case of insulin-dependent diabetes that there is an exaggerated response to glucagon. (See my comment above.) I would guess that in that case again, eating more frequently would prevent the cortisol response. I'm (non-insulin dependent) diabetic, and no matter how low carb/high fat I eat, I can't get into ketosis (as measured by a NovaMax meter). My cortisol tests at the top of or above normal levels, and my blood glucose is always higher than would be possible from the low carb/moderate protein I eat.The liver making/adding glucose is the only other place it could be coming from. I don't know what is driving what, but I'd like to fix it. I am not sure what you are trying to get at. Yes, if you are eating very low amounts of carbohydrate then the sugar in your blood is coming from GNG. GNG hums along fine without requiring excess cortisol, which is the point of this post. Your high cortisol (and high blood sugar for that matter) probably reflects your diabetic state, since cortisol is dysregulated in metabolic syndrome. A low carb diet will normally correct all of that, but not instantaneously. And there are other causes of high cortisol, such as sleep deprivation. over-exercising, and undereating. As to ketosis, I don't know why you wouldn't be. Have you measured your food? Forgive me if this doesn't apply, but I've seen many people eating foods they assumed were low carb, but which weren't, or which weren't low carb in the quantities they were eating. Are you sure the meter is working correctly? Ah, maybe what you were saying that I wasn't getting is that you think your levels of cortisol may be causing your high blood sugar by causing higher rates of GNG? That's a possible contributor, although I think the standard explanation is that you are insulin resistant, so you are having trouble clearing sugar out. I.e. the problem could just as well be on the output side as the input. Just knowing your BG level isn't enough to deduce production or uptake. It would be like having an overflowing bathtub -- I can't tell whether the problem is that the water's coming in too fast, or that the drain is clogged. What about people with low cortisol (hypocortisolemia). Is it possible they have more problems with gluconeogenesis on a very low carb diet and therefore don't feel as well? This low cortisol state has been verified for people with atypical depression, chronic fatigue, fibromyalgia and post tramatic stress disorder. The theory is that chronicly elevated cortisol levels ultimately result in the body downregulating (through a feedback loop) HPA activity resulting in a low cortisol state. This hypocortisolemia is more common in those who experienced abuse or trauma in childhood. While this has some advantages for health in protecting against chronically elevated cortisol, it has its own set of health problems including inflammation, hyperimmunity, and mood issues. People with hypocortisolemia are unable to mount an appropriate cortisol response to stressors. I wonder if a very low carb diet would be such a stressor and perhaps this might explain why some people don't feel well on the diet? That's a complex question to answer. Ultimately, if a keto diet increases cortisol production through some mechanism (we've shown it's not GNG), and you have a problem producing cortisol, then that would have consequences, but I don't know what they would be. Lone Star, I have had CFS/CFIDS for 20 years. I believe, but obviously cannot prove, that is was brought on by a very high carbohydrate (vegan) diet comprised of only of whole natural high carb foods. I had severe hypoglycemia for years before finally collapsing in college and spending the next 10 years in bed. Low carb has made a world of difference in my health. I am still new to a fully Ketogenic diet, but I can already tell that it is much more stabilizing for my blood sugar than just low carb was. I have come to the conclusion that I am extremely carbohydrate sensitive. Even sour cream, which I love, with only 1 gram of carb per ounce seems to make me hungry. The same goes for leafy green vegetables like lettuce, spinach, dandelion, etc. which are considered to be the least like to trigger an insulin/leptin response in a carb sensitive person. A small piece of fruit, even very low fructose raspberries, will not only cause insatiable hunger for the entire rest of the day, but it will make me so irritable that I almost want to kill whoever is in my way! I am not exaggerating. I think I am genetically carb sensitive (obesity, type 1 & 2 diabetes in my family), but I also think my exclusive plant-based diet for so many years worsened a propensity that was already there. The farther away I get from all carbs, the better I feel. I am hopeful that a fully Ketogenic diet comprised exclusively of meat will help me to become a functional member of society once again. Time will tell. But, either way, I KNOW that my HPA-Axis is royally messed up as I has severe orthostatic hypotension and tachycardia if I do not consume an abundance of salt, and yet, I am doing very well on a no carb diet. I think not enough salt in the diet, especially a Ketogenic diet, can be a disaster for some people. Fortunately, I had already figured out the salt piece before stumbling upon Ketogenic eating and took Phinney's warning very seriously. I drink lots of bone broth with sea salt to taste, plus I add sea salt to all the water I consume. It makes a huge difference for me. "Since keto dieters do not normally appear to suffer from hypoglycemic episodes, especially when eating enough protein and not fasting for long periods"
Does this imply that fasting + ketosis ≠ awesome? I'm enamored of research indicating that restricted calorie diets and fasting have benefits both broad and deep for your brain , as I am enamored of the evidence for ketosis so thoughtfully laid out here, so I'm eager to learn from the potential conflict between the two prescriptions. Haven't read all the studies behind this list, happy to post references if desired. "Does this imply that fasting + ketosis ≠ awesome?" That only appears to be true for people with certain disorders, or strong susceptibility to hypoglycemia. For those people fasting is never awesome. And of course, no one can fast forever. Everyone has a no longer awesome point with that. For people without those issues (and even some who have hypoglycemia when they are not ketogenic), to the contrary, fasting appears to be *much* easier when keto-adapted. This makes sense, because gluconeogenesis ensures a very stable blood sugar. Yes! Ketogenic diets are extremely neuroprotective. A post on that is definitely in the queue. The queue, however, is growing much faster than I am writing. I have done a lot of fasting during the past 20 years. I have CFS/CFIDS which has caused me to develop a negative reaction to all plant foods. I now believe this is due to mitochondrial dysfunction that is present in this illness. Most all plant foods have salicylates in them and I seem to be extremely sensitive to salicylates. In addition to salicylate sensitively, I am also extremely carbohydrate sensitive, maybe even completely intolerant. I have come across the Ketogenic diet a few times over the years, but there was never enough information for me to undertake it with any degree of success. And I had a very difficult time letting go of my vegan diet for ethical reasons. I lived a nightmarish roller coaster ride of severe hypoglycemia coupled with immune reactions to pretty much every food I tried to eat. The result is that I choose to water-only fast for weeks at a time because it was the only thing that brought me any relief at all. The beauty of fasting for me is that it got me off the hypoglycemic ride and eliminated all the foods I was sensitive to, haha! I never felt better than when I was fasting. The problem was also when I tried to reintroduce food because I did not understand that it was both the carbs and the plant toxins that wee the problem, not just food in general. So, it has taken me far too long to come to the place where I am now with the reintroduction of animal foods into my diet. And wouldn't you know it, they stabilize my blood sugar and they don't provoke my immune system. Quel surprise! I must admit that I do feel like a bit of an idiot for having taken so long to finally figure all this out, but I am glad everything I have read and experimented with over the years is finally coming full circle. My point in explaining all of this is to share that in my experience fasting was very stabilizing for my blood sugar even as a high carb eater (once I got past the first few hours of misery). In retrospect, I now realized that this is because it forced my body to burn body fat for energy, thus putting me into a state of ketosis. It all makes perfect sense to me now. It seems that a zero-carb Ketogenic diet offers all the same benefits of fasting while still allowing one to enjoy food...LOL...it is a real tragedy that so many people like myself have to suffer for so long because the people who should know how to help us - the doctors - are just as ignorant than we are about how the human body works. Illnesses like CFS/CFIDS are incredibly complex in nature, but I suspect the cure is very simple for the majority of those afflicted. "Eat meat. Not too little. Mostly fat." as Amber has so eloquently re-written Pollen's famous quote. Thank you so much for illuminating this issue. I am currently back on a ketogenic diet after a one-year hiatus that was inspired by the fear of cortisol and inflammation. I was happily losing weight while eating very low carb, but started suffering sleeplessness and irritability. I had been convinced by the science-based arguments made by people like Gary Taubes, but then got scared by everything I started reading on the blogosphere. So I went hard the other direction, eating tons of starch. When I started gaining weight, I started trying other alternatives like intermittent fasting. I'm very happy to be back in ketosis after a very unnecessary year of experimentation. I'm losing weight again and I feel good. I now believe that the reason I started feeling poorly last time was too much protein and not enough fat. So now I avoid huge portions of protein and try to keep meals reasonable with plenty of healthy fats. I really appreciate this blog post because staying on a ketogenic diet means constantly ignoring the ceaseless voices that tell you it is very unhealthy - family, the medical community, and even otherwise enlightened paleo writers. Hi, Mike. I'm glad you are feeling good now. Sometimes those experiments that don't work out are the most important of all. Failed experimentation has definitely convinced me against the paleo community's drum-beating about "safe starches", that's for sure. I avoid wheat out of necessity because I find I get a lot more migraines of greater intensity if I eat it, and I seem to have more lower GI issues as well. I've never been diagnosed with celiac, but I know what a pain in the patootie it is to get tested, and usually you have to eat gluten for a certain amount of time beforehand. Not worth it to me. I know I react, so there's no point eating it. But eating non-gluten starches does me no favors either. Even potato causes weight gain. We're talking to the tune of some 30 pounds packed back on, mostly in the abdominal region, over the past year. And I feel like if I have to do Crossfit five days a week (I don't do Crossfit, but if I did) to keep that from happening, the problem isn't that I'm not doing Crossfit five days a week, but that I'm eating something my body doesn't want me to eat. I had gotten below 200 pounds for the first time in something like eight years. I'd like to get back below, and stay there this time. And to not have to spend the second half of my life fighting type 2 diabetes, either. If I'm not there yet, I'm awfully close. "Gluconeogenesis does not require high levels of cortisol." That depends on substrate availability. If someone's too active for their carb intake, they'll be burning carbs at a faster rate than they're consuming them. Carbs can be burned at a rate of up to 4g/minute (at 100% intensity). If muscle & liver glycogen stores become completely depleted and there's insufficient glycerol, lactate & glucogenic amino acids to generate blood glucose, BG drops and ACTH is secreted by the pituitary. Cortisol rises & catabolises LBM into amino acids, as well as a load of other bad things. Yes, the hypoglycemia of overexercise is touched on in the first reference. But that is a special case. It is not true in general or in normal circumstances that GNG requires cortisol. Note that this cortisol from hypoglycemia of overexercise is a problem whether you are ketogenic or not. "Note that this cortisol from hypoglycemia of overexercise is a problem whether you are ketogenic or not." I agree. Someone in prolonged ketosis has considerably less stored muscle & liver glycogen than someone on a high-carb diet. On the plus side, RER/RQ is reduced in ketosis, which reduces carb-burning, as per Vogt et al. I know someone who over-exercised on a VLCKD and passed-out momentarily due to hypoglycaemia. I don't know how common an occurrence this is. What about people on extremely-high-fat, low-protein diets? Jimmy Moore has reported on his blog, problems with chronically-high cortisol & high fasting blood glucose. Does this suggest that EHFLP diets are not a good idea? I'm against them for reasons of excessive 2 to 4 hour postprandial lipaemia. Yikes about passing out. Not fun. I have done TKD (targeted ketogenic diet) in the past, when I was worried about running out of sugar weight lifting. You take fast-acting sugar, usually dextrose, right before working out. You use it up, and are back in ketosis almost immediately. For my purposes, it didn't turn out to be necessary, though. I just don't work out that intensely. That said, you should read my other posts about cortisol: The Ketogenic Diet's Effect on Cortisol Metabolism, which argues that higher cortisol levels in keto are a refection of better regeneration and actually correspond to less production; and Red Light, Green Light: responses to cortisol levels in keto vs. longevity research, which shows that in longevity research, mild elevations of cortisol are pro-longevity markers, and so the relationship is not as clear-cut as it may seem on the surface. I don't personally worry about high levels of fat in the blood immediately after eating, because I think the harm that is associated with that is in the context of high blood sugar. I haven't investigated that aspect of it thoroughly, though. "I don't personally worry about high levels of fat in the blood immediately after eating, because I think the harm that is associated with that is in the context of high blood sugar." That's not correct. See Ultra-high-fat (~80%) diets: The good, the bad and the ugly and I'm NOT a lipophobe, I'm a very naughty boy! If I understand your first argument, the crux of it is this: "It's pure speculation that the subjects in the above studies had high blood glucose at the same time as high postprandial TG's." That's a good point. I'll think on it. I actually have a post somewhere (in my giant, depressingly long, unfinished drafts list) about TG and statistics that might bear on it. As to the second one, I don't see what it has to do with low carb dieters. Perhaps I misunderstand your argument? Or is it the same argument? I was also interested in the further link to the Stenosis Can Still Exist in Absence of Coronary Calcium study. Thank you. I look forward to more discussion. The second link is saying much the same as the first. A certain person who's on a VLCVHF diet (~80%E from fat) claims that he doesn't have high 2-4 hour PP TG's, without having had any PP TG tests done! I'm not talking about Jimmy Moore. I don't have any serum TG plots for keto dieters. Being in ketosis means that fat oxidation is higher, so TG's would clear from circulation faster. However, TG clearance doesn't begin until ~4 hours has elapsed, so it would make no significant difference to 2-4 hour PP TG's. I've recently come across a study about chylomicrons & cholesterol transport. It's Postprandial chylomicrons: potent vehicles for transporting cholesterol from endogenous LDL+HDL and cell membranes to the liver via LCAT and CETP. "The presence of CMs in plasma suppressed the ability of endogenous lipoproteins to accept cholesterol from RBCs." if LDL has its ability to accept cholesterol suppressed, it would become small, dense, cholesterol-depleted, triglyceride-rich LDL i.e. sdLDL. This would result in an increase in LDL-P (more particles required to carry the same amount of chol) and increased mortality. What say you?